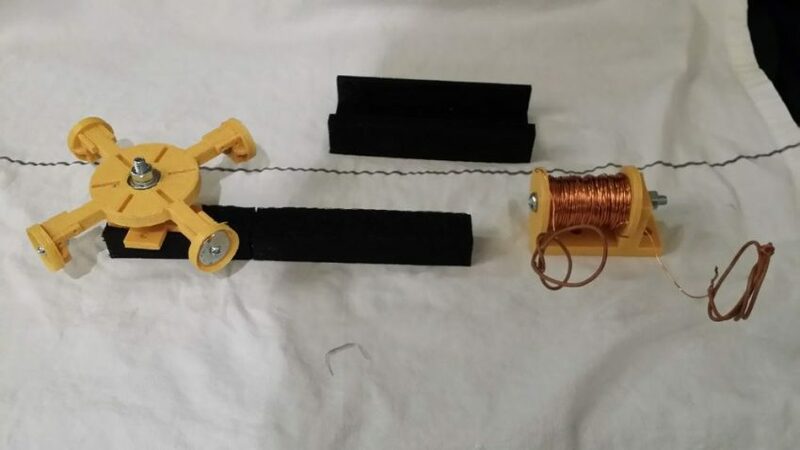 This is a motor demonstration project I made from a posting I seen on Thingiverse. As posted on Thingiverse, the motor did not spin so I designed an electronic solenoid type driver circuit so it would turn. The basic principle of operation is as follows. 1. All poles on the rotating 4 poles must be the same/South or North. 2. 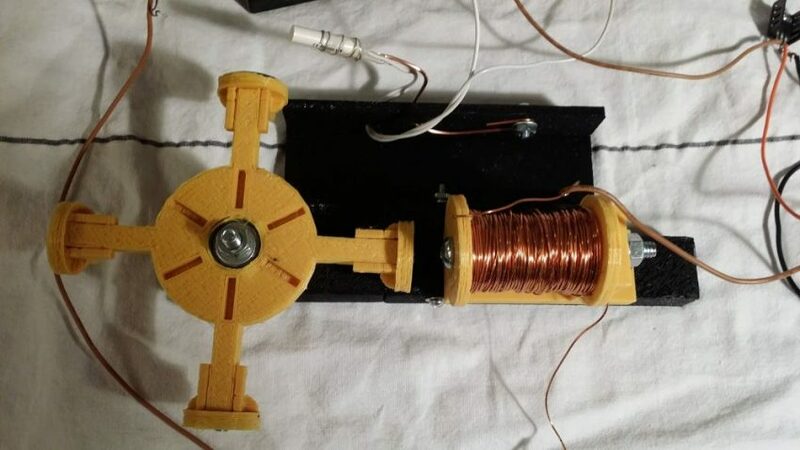 When power is connected to the Solenoid/Coil, it must repel the rotating magnets. Simply reverse coil connections to reverse electro-magnet polarity if they are backwards upon first testing. 3. The TIP120 is a Darlington transistor amplifier circuit. 4. The white sensor seen in the photos is an alarm system door contact which has an internal glass bead “reed” switch, which is activated each time the rotor swings around. 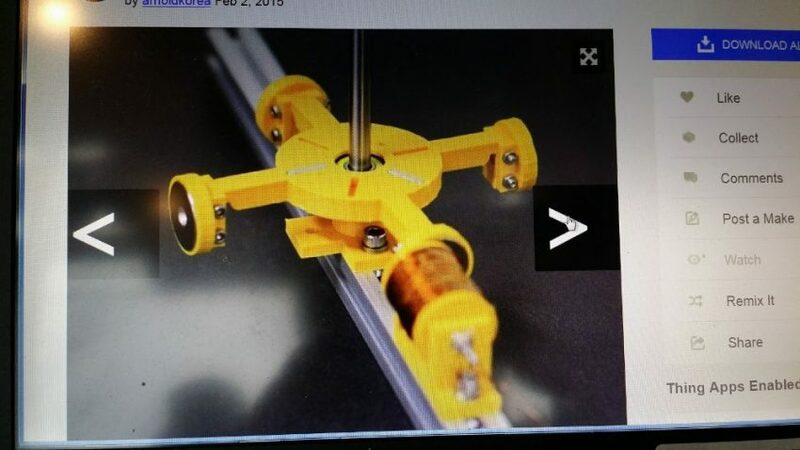 The sensor must be positioned such that it just closes or “makes” a connection when the solenoid magnet is a few degrees past center and “pushes” the opposing magnet on the rotor outward and causes the rotor to spin to the next position where the process is repeated. 5. All parts are available on Ebay or any electronics parts store. 6. 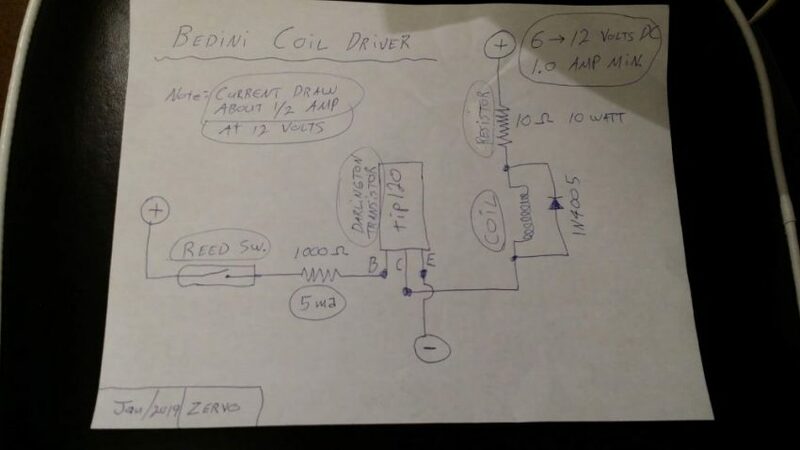 I first used the reed switch to drive the solenoid/coil directly but it drew too much power (about 400ma) and burnt out the reed switch after about 1 minute of operation. 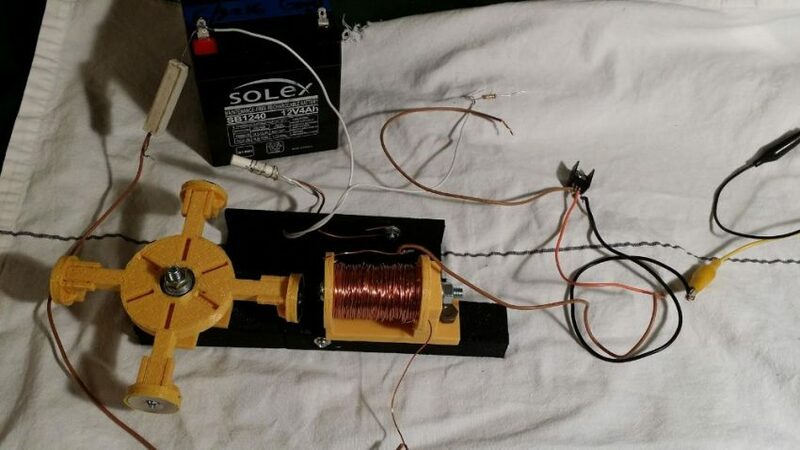 Therefore you need some kind of circuit to drive the solenoid. The reed switch now only draws about 5 ma. 7. The black plastic frame are just parts I designed with Tinker-cad, and if anyone wants the .stl files I could probably upload them. 8. 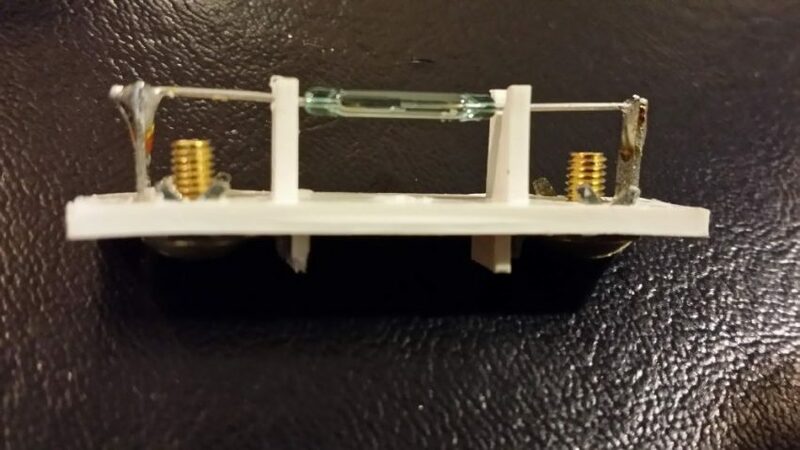 Included is a photo of the inside of a typical reed switch contact showing the actual contact area. It’s amazing that it can vibrate many times a second. 9. I’ve posted a photo of the circuit I designed to drive the solenoid coil. I included the 10 ohm resistor in the circuit because the transistor was getting too hot without it. It also worked with a 20 or 30 ohm resistor so you can play around with the values if you want. You might be able to find a solenoid driver circuit on Ebay which does the same thing. 10. 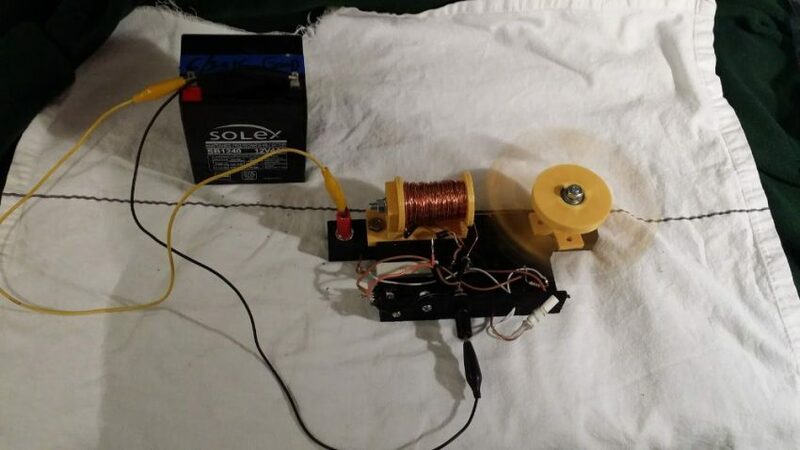 The wire is a spool of enameled wire – 20 awg – 120 feet, cost about $6.50 on Ebay. To spin it onto the spool, just put the spool on the end of a drill and wind it up. Oh, before I forget, I increased the spool size by 1.5 from the Thingiverse size, because I found it to be too small for a project like this.